Browse the products on pg 8 to find favorite soft beverages including Arizona tea, 24-pack Nice! purified water, Ocean Spray juice, 4-pack Red Bull Energy drink, and more. 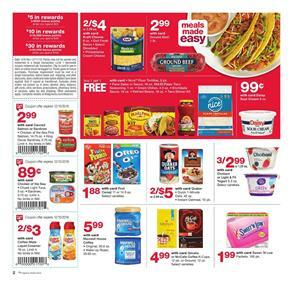 Walgreens Weekly Ad usually has these deals. These may also different due to holiday and Christmas celebration. Really good prices exist now starting to be valid on Sunday. Also, candies, Doritos chips and more can be seen on this page. Doritos and Frito-Lay will be $4 together. Coupon saving on M&M's will be $2 in total. Get those fat savings in order to lower the expense of weekly shopping for the home. Go to pg 7 to see awesome holiday products such as holiday gift sets, novelty holiday candy, and BOGO Free deals on snacks. Betty Crocker baking supplies, Oreo cookies, Candy canes, Mars Minis or Dove chocolate are all viewable products of pg 7. If you are fond of syrups, honey, fruit snacks, etc. please visit pg 6 to see special discounts on such products. Walgreens Ad shows the deals on Nestle semi-sweet morsels, Kraft jet-puffed marshmallows, Hershey's chocolate syrup and Marple syrup. Many more than these are available on the same page. Don't miss out.